What to Feed: At this age baby should be drinking breast milk or formula exclusively. How Much to Feed: Newborns may feed anywhere from 8-12 times a day. By the time baby reaches 3-4 months feedings may be cut down to 8 times per day. 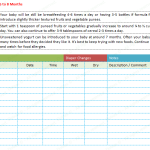 If you’re using formula you can expect your baby to need around 3-4 ounces per feeding during their first month. After that you can expect the feeding amount to increase by about 1 ounce per month, topping out at around 8 ounces. 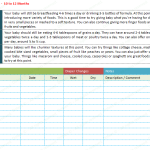 Expect your two month old to be drinking about 4-5 ounces of formula per feeding. An average baby at this age may drink 4-6 bottles of formula per day. Feeding tips: A baby’s digestive system is still immature at this age. Their bodies only require breast milk or formula for nourishment at this stage. For the first few weeks it may be best to feed baby on demand until they are sleeping longer throughout the night. For the first month baby may be eating every 2-4 hours around the clock. What to Feed: Continue to feed breast milk or formula. Your baby may be ready to add a small amount of pureed foods like vegetables, fruits or fortified cereals thinned with breast milk or formula. How Much to Feed: With breastfeeding your baby will be eating around 6 times per day. Formula fed babies will eat around 4-5 times with a maximum of around 32 ounces per day. Feeding Tips: Your baby may be ready to try some solid foods if one or more of the following apply: your baby can hold up their head, sit in a high chair, make chewing motions, close their mouth around a fork or spoon, is teething or still seems hungry after 8-10 feedings of breast milk or 40 ounces of formula. Many people begin with rice cereal or another grain thinned out with breast milk or formula. A good ratio is 1 teaspoon of cereal with 4-5 teaspoons of breast milk or formula. It’s best to make it a very thin consistency at first. Once you’ve established solid feeding you can add in new foods like other grains, fruits and vegetables. Mild vegetables like green beans, squash or carrots are good first vegetables to try. Try only one new food at a time and watch for food sensitivities or allergies with each new food. Its best to wait 3 days in between introducing new foods to be sure there are no allergies. What to Feed: Your baby will be still be breastfeeding 4-6 times a day or having 3-5 bottles if formula fed. At this age you can introduce slightly thicker textured fruits and vegetable purees. How Much to Feed: Start with 1 teaspoon of pureed fruits or vegetables gradually increase to around ¼ to ½ cup in 2 or 3 feedings per day. You can also continue to offer 3-9 tablespoons of cereal 2-3 times a day. Feeding Tips: Unsweetened yogurt can be introduced to your baby at around 7 months. Often your baby will refuse a new food many times before they decided they like it. It’s best to keep trying with new foods. Continue to space out new foods and watch for food allergies. What to Feed: Your baby will still be breastfeeding 4-6 times or taking 3-5 bottles of formula per day. At around 8 months you can introduce meat and protein. Continue with new fruits and vegetables and add in more thickly textured items. How Much to Feed: Your baby should be eating 4-6 tablespoons of grains a day, usually in the form of baby cereal. They can have around 2-4 tablespoons of fruits and vegetables twice a day and 1-3 tablespoons of finely milled meat or poultry twice a day. Feeding Tips: When starting proteins start with something soft like eggs, mashed and cooked beans or pureed meats. If your baby has mastered the pincer grasp you can now introduce finger foods. Some good ones to start with are: Cheerios, baby puffs, small pieces of banana, crackers, Zwieback toast and cooked pasta. Avoid the major choking hazards: big pieces of cheese, whole grapes, sliced hot dogs, raisins and whole vegetables. What to Feed: Your baby will still be breastfeeding 4-6 times a day or drinking 3-5 bottles of formula. At this point you can continue introducing more variety of foods. This is a good time to try giving baby what you’re having for dinner as long as it’s in very small pieces or mashed to a soft texture. You can also continue giving more finger foods and thicker textured fruits and vegetables. How Much to Feed: Your baby should still be eating 4-6 tablespoons of grains a day. They can have around 2-4 tablespoons of fruits and vegetables twice a day and 1-3 tablespoons of meat or poultry twice a day. You can also offer one serving of yogurt per day, around ¼ to ½ cup. Feeding Tips: Many babies will like chunkier textures at this point. You can try things like cottage cheese, mashed avocado, softly cooked bite sized vegetables, small pieces of fruit like peaches or pears. You can also just offer some table foods to your baby. Things like macaroni and cheese, cooled soup, casseroles or spaghetti are great foods to allow your baby to try at this point. 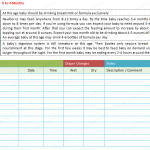 The following is a baby food chart template that you can fill to have helped you in tracking the feeding of your baby so you can track it and update your doctor about what was the feeding progress of during months or year. 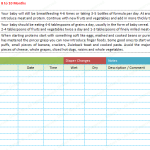 Note: This schedule is just a standard feeding chart so please consult to your doctor and discuss about healthy feeding according to your baby’s health.